Those who were around in the last couple decades of the 20th century will remember a time when the Windows operating system existed as the Windows 3 series. 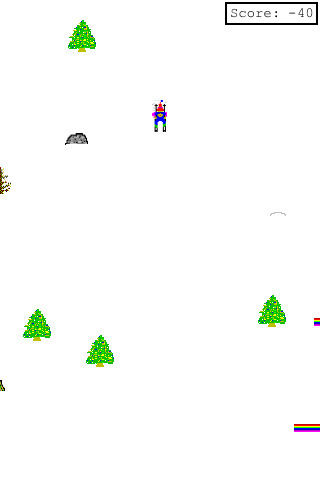 One of the games released in this OS was SkiFree, a simple application with only one objective: dodge obstacles while skiing down a slope. Ring any bells? Well, Indelible Productions has revived the game for the iPhone in all its 32-bit glory. Tap the screen to jump over obstacles and tilt the iPhone to steer the skier. To stop, simply swipe left or right across the screen. If you tap and swipe while in a jump, you earn yourself Style Points. The gameplay of the iPhone’s SkiFree app is nearly identical to that of the Windows game; the only things that are missing from the ported version are the Slalom courses and the Abominable Snow Monster that chases the skiier in hopes for a quick snack, both of which are promised in a future update. Playing SkiFree on the iPhone certainly makes me nostalgic, but also highlights just how far we’ve come since the 1990’s. Nearly every aspect of today’s game apps surpass those of SkiFree: music/sound effects (there are none), graphics, etc. The biggest difference is the use of the iPhone’s accelerometer to control the skier, instead of buttons on a keyboard. It’s not hard to figure out. While it is fun to relive a piece of the past, there isn’t a huge reason to go out and look for this app. Those who do are pretty much in two camps: those who are nostalgic, and those are are curious. It’ll probably be the former who will keep replaying SkiFree, but at least it’s free! AppSafari review of SkiFree! was written by Julie Guan on March 24th, 2010 and categorized under App Store, Fun, Games, Physics Based, Racing, Sports. Page viewed 4572 times, 1 so far today. Need help on using these apps? Please read the Help Page.